Doomtown: Reloaded has had a bumpy ride pardners, to say the least. I can’t begin to thank all of you that of stuck with Pine Box Entertainment through DT:R’s relaunch, those that are getting back in the saddle to join us once again, and those greenhorns new to my favorite card game. With the shipment of There Comes A Reckoning now on the horizon for later this summer, I want to talk a bit about Too Tough to Die, the next expansion. I wish to give you something to look forward to by sharing some aspects about our upcoming plans for DT:R’s Art and Story. Both subjects go hand in hand as we advance the Doomtown: Reloaded storyline to move outside the confines of Gomorra. While There Comes A Reckoning featured a prequel story, Too Tough to Die advances the timeline to October 1881, as Wendy and Lucy arrive in Tombstone in the midst of the epic battle between the Earps and the Cowboys. Along the way, they also encounter the supernatural terrors of Deadlands. You may recall we featured a storyline event at PAX Unplugged, The Fate of Mario Crane. While this story remains in the works, keep in mind that we’re no longer restricted to the Gomorra sandbox. All set-related fiction now becomes canon within the existing Deadlands universe, requiring us to work closely with Pinnacle Entertainment Group to ensue the story advances for both games. As both storylines move forward, players will continue to make choices at events that will influence the fiction. At the Doomtown: Reloaded World Championship on May 5-6 In Manchester, England, players will have an opportunity to shape the fiction included in Too Tough to Die. You may be wondering how this all ties together. Well, during the Deadlands roleplaying game sessions on May 5, players will have the opportunity to select existing and new characters appearing in Too Tough to Die. In some cases, the art for the cards for these characters will directly reflect the fiction, and we will unveil related cards throughout the day. 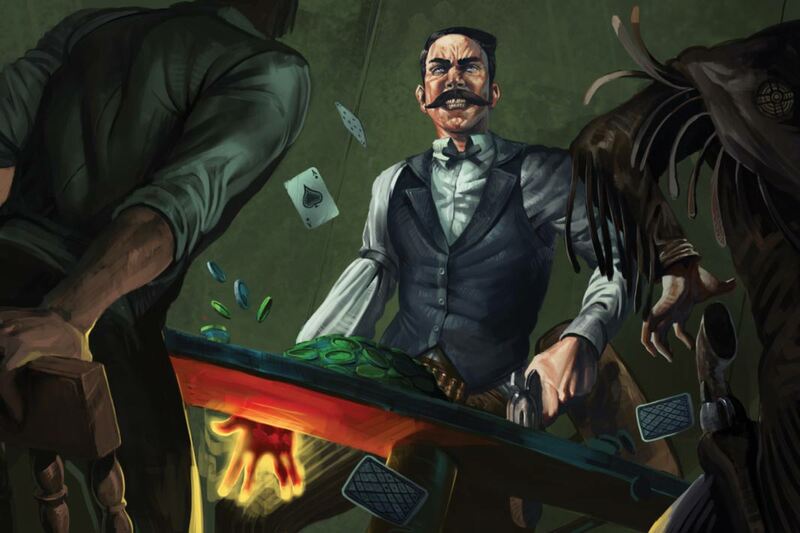 Pay attention to our forums and the Doomtown Facebook groups as players reveal these spoilers. As the RPG adventure continues, players will be shown cards featured in Too Tough to Die based on these scenes, whether it in-game events, items they encounter, or characters themselves. Too Tough to Die not only features this aspect of the story, but the 56 card set also explores previous denizens of Gomorra, as characters such as Kevin Wainwright become Experienced. The set also explores new locations, via Deeds featured in and around Tombstone. In addition, the conflict between the Earps and the Cowboys gets told through several cards. As we continue to flesh out existing mechanical themes in Doomtown, watch for faction specific deeds, such as the Sloane starting deed, Ike’s Place. Including all these different aspects of Too Tough to Die, this required sourcing artwork from a variety of sources. We began by revisiting black and white pieces from the original Deadlands, updated with color, ala the Deadlands 20th Anniversary core rulebook. We will also feature Doomtown: Reloaded art commissioned, but never released under the AEG era, along with revised cards initially slated for unreleased Saddlebag expansions. As we did with TCaR and our ongoing Organized Play events, we’ll continue to honor the Gomorra of yesteryear with a few returns to Classic Deadlands: Doomtown. Also, we are delighted to mention that a trio of artists from DT:R’s original run have created half a dozen pieces for Too Tough to Die. These pieces will be featured alongside some work from current Deadlands artists as well! As thrilling as helping develop this new addition for your Doomtown: Reloaded collection was, there is nothing more rewarding than meeting with everyone face to face in celebrating the game’s rebirth. I can’t wait to meet y’all at the World Championship, where you will be the first to use physical cards from There Comes A Reckoning and directly affect the fiction. Player’s actions in the role-playing sessions will carry over into Doomtown, as votes decided in every matchup will determine the fate of the characters involved.